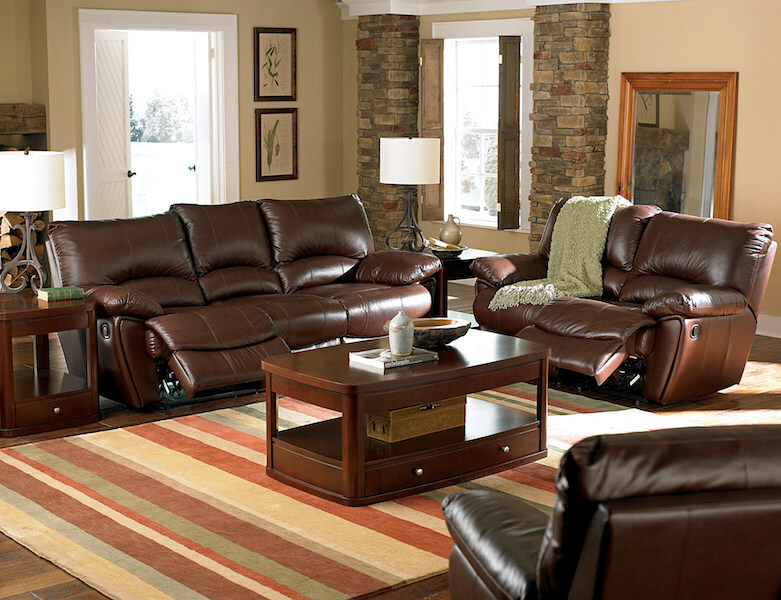 This beautiful brown leather sofa features dual recliners and a cozy middle seat that easily accommodate up to three. Overstuffed pillow arms and plush pillow like seat backs provide ample support and exceptional comfort. A recliner on each end of the sofa includes an external handle for releasing the reclining mechanism and allows you to settle in for complete relaxation. A rich leather match wraps the entire sofa for a durable yet beautiful finish designed to withstand everyday use. Important! Many items require assembly. Any item that requires assembly will include the instructions and any tool needed to complete the assembly. If you have questions about a particular item please contact customer service. Important! Please note: Images: Images of items are for reference only. Not all items pictured in images are included in product pricing. For example, if you see a mattress on a bed in an image, unless the description of the product includes said mattress, the mattress would not be included. This example would be the same for any items that are pictured and not included in description of actual item being sold. Please use description of item and title to understand what is included. If you have questions as to what is included, please contact our office. Color: The color of the items may vary due to variance on monitor and device settings in which the item is being viewed and or picture resolution of image obtained for display. Color described is based on manufacturer description. We do not attempt to interpret colors for the basis of description of items. If you have a question about the particular color, please contact our office. Finish/Fabric: Finishes and fabric textures may appear different due to the variance on monitor and device settings in which the item is being viewed and or picture resolution of the image obtained for display. Descriptions of fabrics and finishes are based on manufacturer descriptions. If you have a question about the particular finish or fabric of an item, please contact our office. Assembly: Most items do not come fully assembled and will be delivered in the box in which they were shipped to the distributor from. The boxes are designed to protect the items during transit. If assembly is desired, please select from desired assembly. If your order qualifies for Free Assembly special, please communicate prior to delivery that you would like your items assembled. Additionally, not all items are available to be assembled from our agents. Please see details in our Help Section. FHF is amazing. This is the second time I've ordered furniture with them, totaling around $4,000. They have the best deals, customer service, and fast delivery. Thanks for everything!